Then remember to take off the handbrake !! If you have anything you check before journeys which is not on our Travel Checklist, please let us know. A good tip is to copy our above list (adding items you wish) and then laminate it - you can use the same list before every journey using a dry-wipe pen. We hope our Checklist helps you - it is very easy to miss out one of the above jobs which could make your journey less safe or even damage your caravan. We have seen lots of caravans on the road with their rooflights open and there is no way of letting them know. 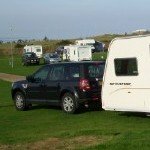 Please click here if you would like some free printable caravan packing checklists.